Merchants, transit users and area residents were thrilled last week to see Concession Street re-opened across the northern edge of the Mountain. This is the only multi-block retail district on the Mountain built in a walkable, urban form. With new benches, lighting and a few zebra crosswalks, the area is certainly more walkable than it was prior to the full reconstruction project. Hamilton's Escarpment running through the city affords us a great opportunity for a dramatic local cycling route connecting with both the Escarpment Rail Trail to the east Mountain and Chedoke Radial Trail to the west. There are some fabulous businesses on Concession, and if the area wasn't so hostile to cyclists it would be a great mid-ride stop for a coffee or bite to eat. Like many cyclists, I routinely map out rides that involve stops at places such as Detour Coffee, Democracy, Dundurn Market, Cannon Coffee, Mulberry, and others that are connected to the cycling network and enjoyable places to stop for a breather and people-watch. Concession Street has the potential to be virtually the only spot on the Mountain where one can people-watch on a pedestrian friendly street, and enjoy a quick snack or coffee (hint, hint). Sadly, the new Concession Street is no better than the old one as far as cyclists are concerned. On opening day, Friday, November 13, I was already hearing stories about cyclists almost getting hit by cars on Concession, and other cyclists riding on sidewalks. Despite the new lanes being painted on the roadway, there is an opportunity at either end of the commercial district to implement simple fixes that could encourage cyclists to come to Concession using nothing more than paint. This stretch has an abundance of wasted road space in the form of hashed-off asphalt, a full lane that is barely used as a right turn lane to East 15th, and turning lanes into Tim Hortons and Shoppers Drug Mart. Public money spent on a public roadway should be focused on public transportation, not turning lanes into private parking lots. There is a simple solution for this stretch. Remove the second eastbound lane on Concession from Sam Lawrence to E15th and redistribute those ten feet of roadway with five-foot-wide bike lanes on either side of the street. At E15th, the sidewalk pinches as a bumpout and large, visible bike sharrows should be used to continue the cycling 'infrastructure' east to Belwood Ave where through cyclists can head north to the Mountain Brow. This extra road space would again allow for bike lanes on either side over to Upper Wentworth, where bike lanes are planned at some point southbound from Concession. From this point, again, large sharrows look to be the only option east of Concession to allow cyclists into the heart of the commercial district. Along the Mountain Brow east of Concession, there is again ample roadspace for bike lanes from the top of the Kenilworth traffic circle westbound right to Upper Sherman and the eastern entrance to the commercial district. Again, large, bold sharrows would be needed in the centre of the street directing autos and cyclists to share the retail district of Concession. These minor changes would create much safer cycling conditions on the wider, faster edges of the retail district and could allow businesses to add bike parking and cyclists promotions to lure in riders from around the city. With the fabulous views of the city one block north of Concession, and the ever-growing stable of businesses on the street, it could become a hub for cyclists on the edge of Hamilton Mountain. But it's also a failure of the City's "Shifting Gears" Cycling Master Plan, which, as Duvall pointed out last week on Twitter, doesn't specify bike lanes on Concession: "Bike Lanes were not recommended for Concession In the Cycling Master Plan". This is just one way in which our Cycling Master Plan acts as a limit on growth in our cycling network. Unlike the recently-approved Pedestrian Mobility Plan, which advocates "routine accommodation" of walking on every street, the Cycling Master Plan defines a set of streets that might get some form of cycling infrastructure and by default excludes every street that is not specifically defined. In addition, Councillors gave themselves the right to veto projects in their own wards, which both Duvall and Ward 6 Councillor Tom Jackson have exercised. The result is a fragmentary bike lane network and huge wasted opportunities to add facilities during once-in-a-generation road reconstructions. oh, and don't forget, these same councillors whine and cry when they aren't loaded up with Sobi hubs. I keep dreaming of the day when the ward boundaries are re-drawn and the North Mountain gets its own councilor to properly look out for it instead of suburbia. The north-south stretched wards of the mountain effectively gerrymanders it into voting suburban even where it isn't. Hamilton missed the mark again. Unbelievable, in the process of redeveloping the area it's hard to think a city planner or someone wouldn't stop and attempt to include what has made so many other cities people places. Would have been good for business, environment and livability. Looks like a concrete jungle with a 1950's approach and mindset. Ugly and no imagination. Wow!! Escalator might cost too much operationally -- electricity is enormous for a long/multistage escalator. To protect it from the elements, you'd need a long shelter for it (like Ontario Science Centre, only much longer -- and probably heated) and this will cost far more than a gondola, and require dynamiting the escarpment -- something not easy to sell to the population nowadays. This is accessible (1 wheelchair, plus a bike hook), so families with strollers can use it. It could be an opportunity to extend the BIA revitalization eastwards past the Juravinski Hospital. Although you do have to walk past some old apartment blocks (that looks in relatively poor shape) next to Concession Park. I'm not sure how long these apartment blocks will last, but if they fall apart in 20 years.... Then this might be a future opportunity to rebuild some better mixed-income-retail development someday right next to Concession Park, to extend the BIA right up to the Gage-Mountain Park Gondola, perhaps after it's already built. 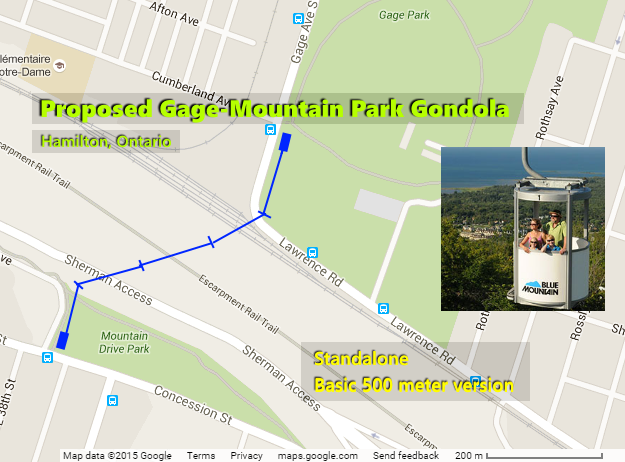 There's a Beckett Drive gondola as well, in the Hamilton Trails Master Plan, though does not currently include the proposed Gage-Mountain Park Gondola. I've helped bring attention to an error by the construction staff. @mdrejhon thank you Mark! Will look into this asap!!! 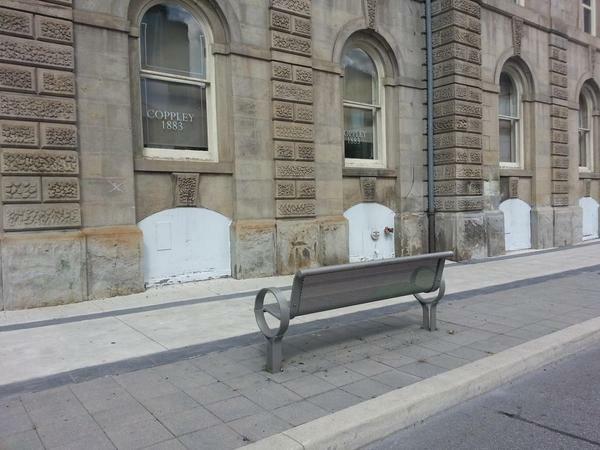 @ConcessionBIA I saw a horizontal line where bench should go; but maybe worker misinterpreted arrow as "move it there" than "face that way"? That is too funny! What were the installers thinking? Probably 'Let's get this ! @#$ thing screwed in and go for a coffee'. Concession street desperately needs trees. I saw the photo with the street with trees and immediately thought, oh ya that looks nice. Then soon after realized that it was Buffalo. while I was driving around 50-55km along Concession heading E from Upp Wellington, a guy in a pick-up passed me at around 70-80k. Why? Because he can. In fact, he is encouraged to by a street design that has built an entirely empty, useless lane next to the sidewalk from Sam Lawrence Park to E 15th. City Hall will be pleased to know that the grand Hamilton tradition of screaming along at highway speeds inches from pedestrians is alive and well. the speed humps and 30km speed limit all along Mountain Park Ave are gone. Because Mtn Park needs to be 50k with no traffic calming. 20-minute city is clearly alive and well. This is so discouraging. And to think Scott Duvall was elected to be the federal rep for this area after his poor record on progressive policies. Sad. As was pointed out by someone, why on earth was Concession not lined with trees with this rebuild? Especially since the city added those rather useless stretches of orange concrete. Perfect spot to add a tree canopy with open garden bases to divert rainwater from city sewers. Instead we pave over everything in sight and then complain about the load on our storm water system. Parkdale North was rebuilt like this about 25 years ago. In other words, Hamilton hasn't touched their road re-building manual in at least a few decades. How Hamilton can continue trotting out old infrastructure projects with zero thought towards cyclists, water diversion or tree canopies is really quite mind-boggling.